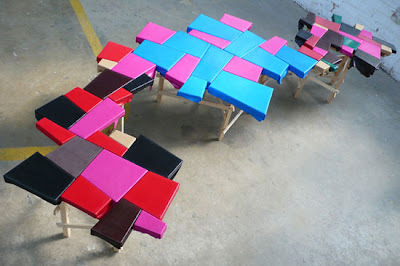 These tables are the creation of Peter Marigold and are made out of waste leather from Fendi production. They will be on view at the 'Craft Punk' Design Miami/ performance. The basic shape is a bisected square, and resulting pieces are repeated to generate the final form. 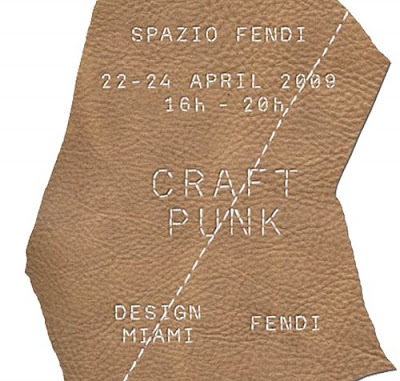 The 'Craft Punk' event will be hosted by Fendi in a 750 square meter space. There will be invited many emergent designers from around the world to work, onsite, with discarded materials from the Fendi production. These include: leather, branded fabrics, plastic decorative elements, and metal hardware. Isn't this an EXCELLENT idea to make use of waste materials? I wonder whether other fashion giants will adopt this idea, too. In one way or another. Anyway, Fendi is one step ahead because of the interior furniture line Fendi Casa but hey, never say never.